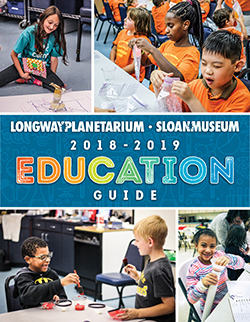 Sloan Museum's interactive history and social studies programs are available as onsite field trips through December 9, 2018, and as in-school takeout programs throughout the 2018-2019 school year. All social studies activities last approximately one hour and have limited seating. 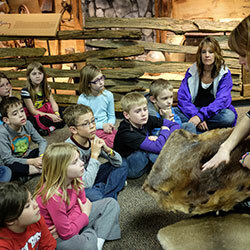 Call 810-237-3409 to book your field trip. Discover how museums play an important role in keeping history alive and exciting for future generations. 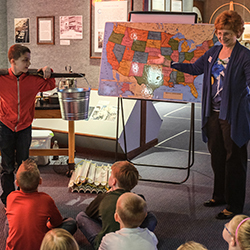 Students will travel back in time to explore historical objects and learn about people from the past through hands-on activities. Compare and contrast historical artifacts with the objects used in the present, and think about what people in the future may use for a similar purpose. 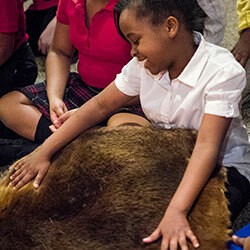 Students will explore the past, present, and future from the perspective of their own lives. 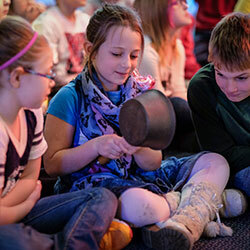 Join a museum educator for historical story time, identify the important details and people from the story, and compare life today with life in the past while creating a hands-on project to take home. What is a community? It’s never too soon to learn how communities work. 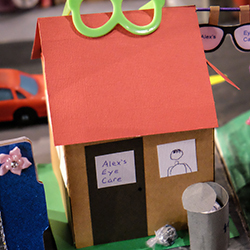 Join our educators as they focus on the importance of transportation, location, communication, and infrastructure to help “build a city” and make it successful. Each team will discuss, plan, and build a two dimensional model city. Study the early interactions between the Anishnabeg and the first European explorers in Michigan using primary and secondary sources. Learn how the People of the Three Fires and the French developed relationships with each other through the fur trade system in order to meet their wants and needs. Explore the incentives and opportunity costs involved with Michigan’s fur trade, and how it impacted life, culture, and the environment. Explore how the people of the Three Fires Confederacy (Ojibway, Odawa, and Potawatomi) adapted to and used their environment and natural resources to meet their basic needs for survival. 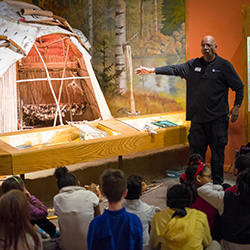 Investigate primary sources, visual evidence, artifacts, and replicas through hands-on activities in order to answer historical questions about daily life for the Anishnabeg in the early history of Michigan. Students will travel back in time to the opening of the Erie Canal and learn how it led to a significant population growth in Michigan. Go on a journey with a pioneer family who is migrating from New York to the wilderness of Michigan through hands-on activities. Discover how pioneers had to make difficult decisions, trek through the harsh landscape with few possessions, and adapt to and use natural resources and their environment to survive and create new lives in Michigan. 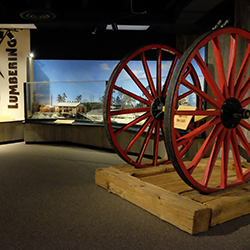 Explore how Michigan and the Great Lakes region was once the center of the American lumber industry. Examine how Flint and other Michigan cities used the abundance of trees and waterways to develop economic growth. Investigate life in a lumbering camp through primary and secondary sources. Discover how lumber barons used natural, human, and capital resources to make their businesses successful. Students will explore transportation history, and the development of the automotive industry in Flint. Discover the challenges of working on an assembly line. 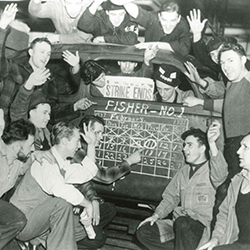 Investigate the events surrounding the Flint Sit-Down Strike, and the various perspectives of the individuals involved during this significant period of the labor movement and history in Michigan. 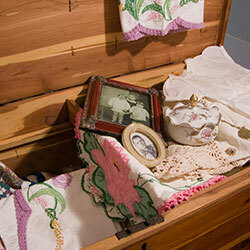 Working in teams, uncover the history behind a trunkful of mysteriously abandoned artifacts from the past. Investigate each object using keen detective skills, historical thinking, visual evidence, and primary and secondary sources. Can you figure out what the mystery objects are, where they came from, when and how they were used, and who made or used them?